Frankly, this was a better film than I thought it would be. I knew Gary Oldman would shine, and secretly I am rooting for him to snag the Oscar next month for this performance, but the overall level of acting and the script surprised me. 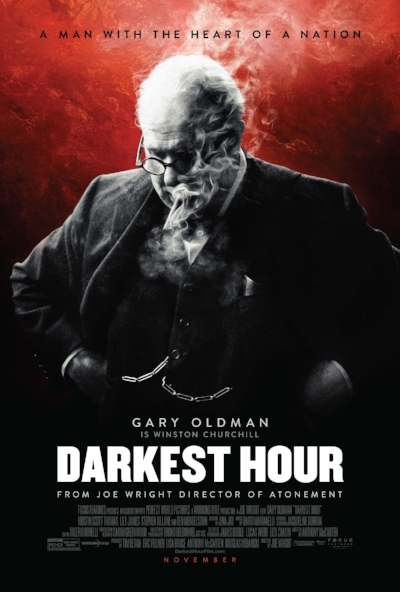 Darkest Hour focuses on Winston Churchill in his first month of becoming Prime Minister. It was a time when the Germans overran Western Europe and British troops found themselves stranded upon the beaches of Dunkirk. For those of you who saw the movie, Dunkirk (also nominated for a Best Picture Oscar), this movie reveals the political side of those events. What I like most is that Churchill isn't portrayed as a super-human here. Rather, he is a boozer who drank from breakfast until he went to bed, who ascends to the P.M. post as part of a political ploy because he is unloved and expected to fail. He is a man out of touch with modern warfare, stubborn in his old ways, who doubts himself to the core once the reality of German success sets upon himself. In other words he is as flawed as the man on the street but when you come down to it, that is his appeal to the man on the street. We learn how the King helped save Winston from certain political downfall in his first month. But I was struck by the fact that we see on the big screen are men who struggle to put their personal desires aside and their political, family fortunes at risk, to serve the good of the nation. In the end, Chamberlain, Churchill and the King all did that at crucial moments. They were men who in the darkest hour led by example. The acting by the entire cast of this movie is superb. The script keeps you wondering what's coming next. If you get a chance to see this movie, I highly recommend it. Definitely worth the ticket price and a 5/5 on my rating scale.